Liquid calories, and especially those that are sugar-sweetened, are the lowest hanging fruit on the tree of dietary improvement. Whether for control of calories, or as a means to reduce consumption of free sugars, getting juice and sugar-sweetened milk out of our kids schools, a place where they spend the majority of their weeks' waking hours, might have an impact. Ensuring drinking water is available to students at all times. 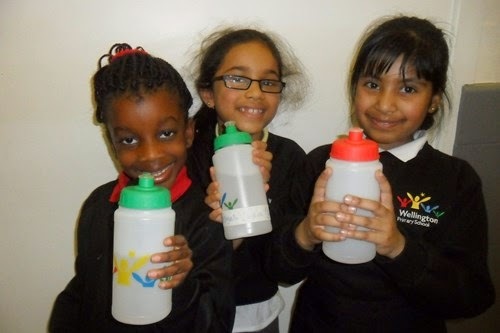 Permitting children to bring only water to school. Providing no sweet drinks through lunch orders or canteens. Ensuring staff model the behaviour by not bringing sweet drinks to school. And as far as the water goes, there are no bottles - it's all tap! Personally, I love this initiative, and hope it spreads, but I also know that many might see it as overly controlling. Perhaps at the very least schools could be "Water Only" in terms of the liquids they offer/sell to students on campus which in turn would leave it exclusively to parents to decide what to send.